Proving once again humans aren’t the only animals to use tools, Australian researchers documented bottlenose dolphins using conch shells to capture fish. Once the conchs contained small fish, the dolphins swam with them to the water’s surface, and raised them above to shake the water out, leaving their prey to slide into their mouths. 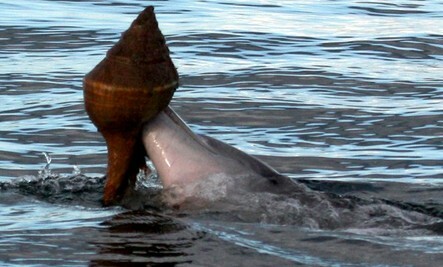 What’s more, the same scientists believe it is possible the dolphins are learning the conch fishing method by observing and imitating one another. Learning is another behavior chiefly associated with humans, but the Murdoch University research is another blow to that human-centric view. To put it simply, scientists are gradually overturning the outdated and false notion that humans are the only intelligent species on the planet, and animals are merely dumb beasts. Video recordings of adult dolphins with young ones observing their behavior when hunting for food have been made previously, with the implication being that the adults are teaching and the young are learning. Social learning and the passing on of culture potentially exist in dolphins. Another example is planking, where dolphins execute tail movements to raise their bodies vertically while moving through water. This behavior has been imitated by dolphins previously that did not engage in it, without human intervention or coercion. In other words, no human trained them to do it, using rewards such as fish every time they executed a movement the human desired. What underlies these observations mentioned above, is the unknown potential of dolphin consciousness, and it relates to the theory of mind. If dolphins are found to have a consciousness similar to people or roughly on the same level, does it mean dolphins are still just animals? I can't believe that there are cultures that support the slaughter of these intellegent nonhuman persons. This is murder and should be stopped. These nonhuman persons are smarter than they are, that's for sure. I just have to say, Good thinking! !